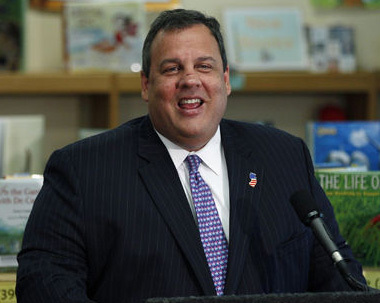 Chris Christie, moments before plunging into the Atlantic Ocean and heading South for the winter. Sea Isle, NJ – As thousands flocked to Sea Isle this past Saturday for the annual Polar Plunge to test their wills against frigid temperatures, they were delighted to see a number of local celebrities taking part in the celebration. Eagles center Jason Kelce frolicked in the surf with the brave citizens who took brief, but impressive, dips in the 35 degree water. However, it wasn’t Kelce who won the day, but current Governor Chris Christie, who was seen swimming in the water for upwards of three hours after the event concluded. Several boats carrying hundreds of passengers sailed up to where the governor was swimming and stayed a respective distance away, letting the passengers snap photographs and ooh and ahh whenever Christie broke the surface of the water. Nobody participating in the plunge could recall seeing the governor on the beach prior to the start of the event. “Around this time of year, Governor Christie will take to the sea and swim down coast in search of fertile hunting grounds,” a media relations employee told reporters crowded on the beach. “We’ll let him stay in for a few hours, eat his weight in krill, and then drive him back up the coast to Trenton on an 18-wheeler flatbed when he gets tired. We’ll make sure to keep him nice and wet during the trip back up to the capital office,” he said.